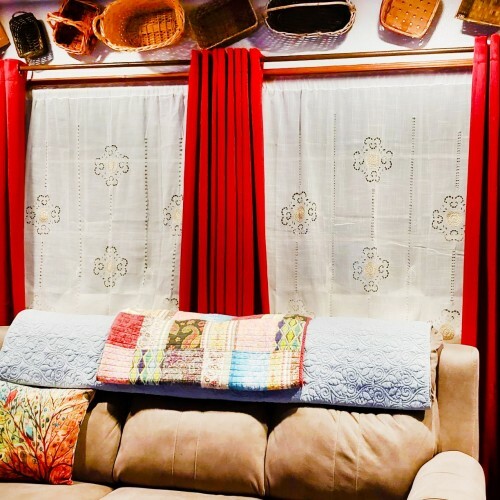 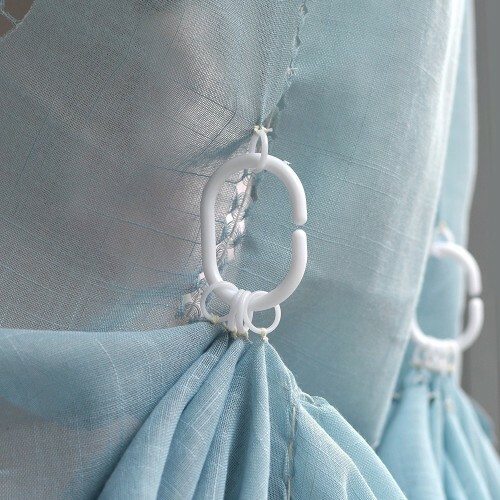 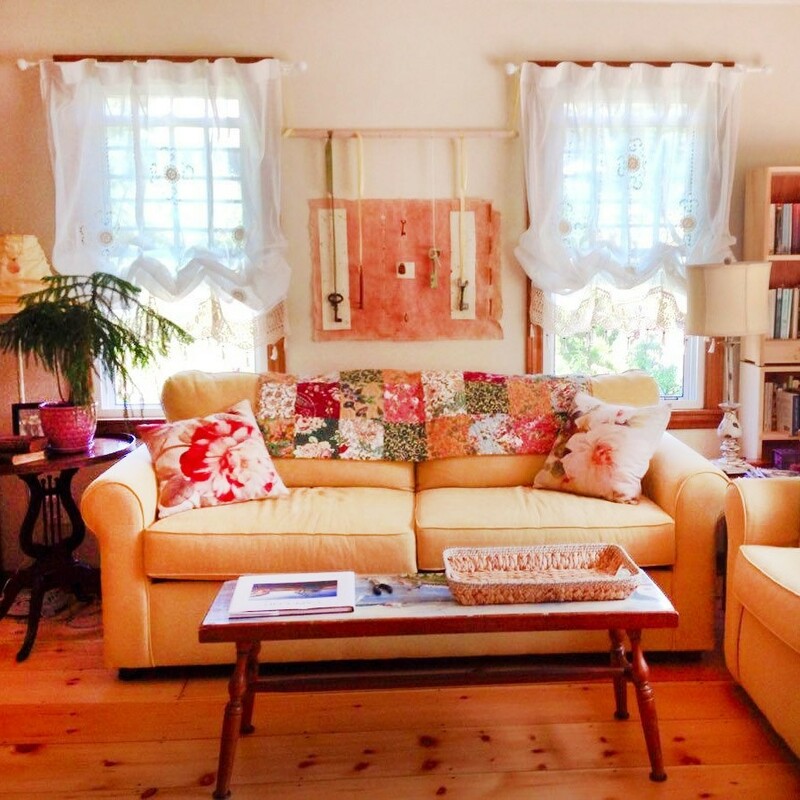 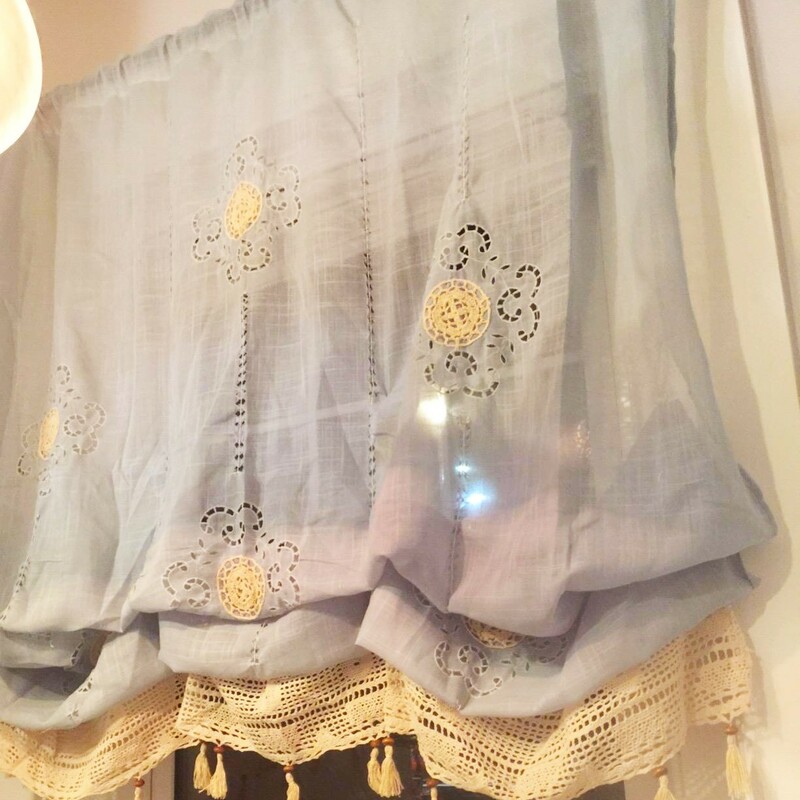 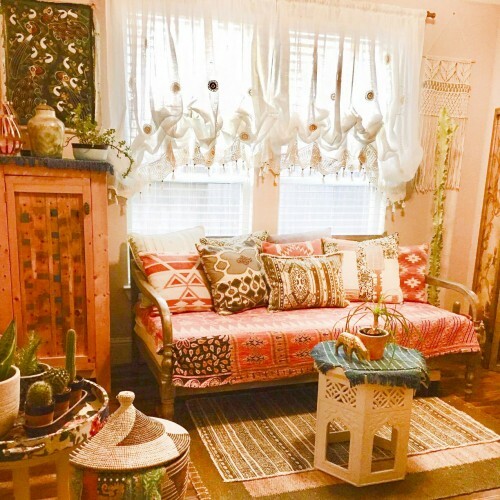 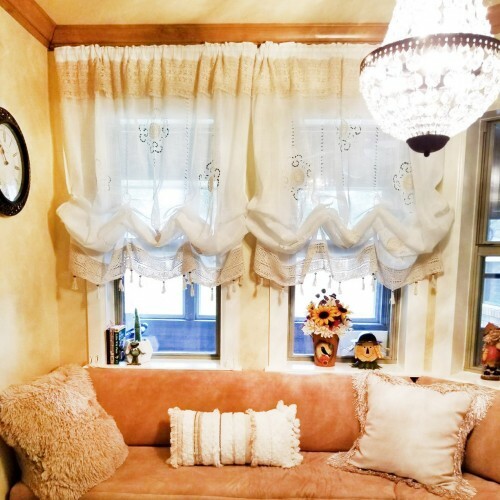 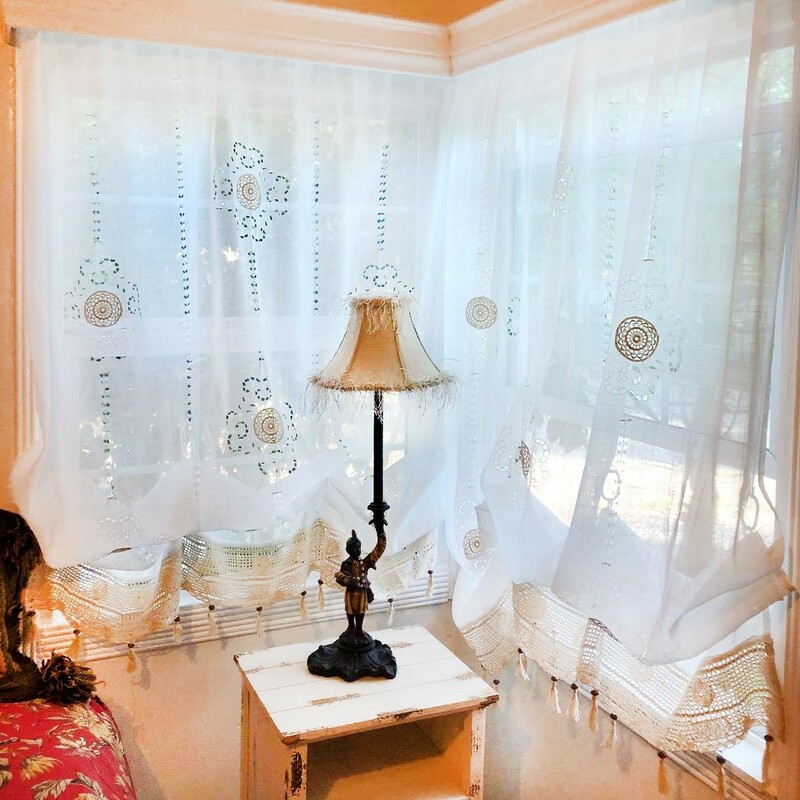 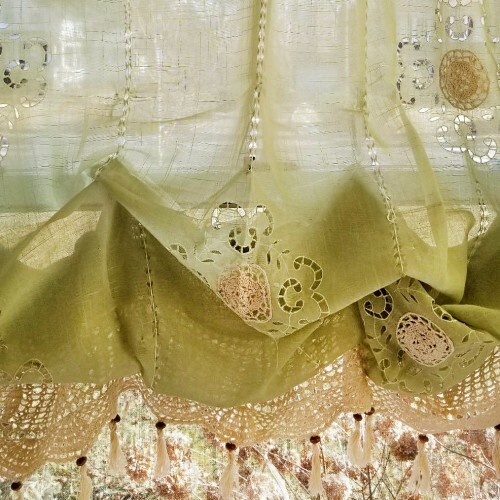 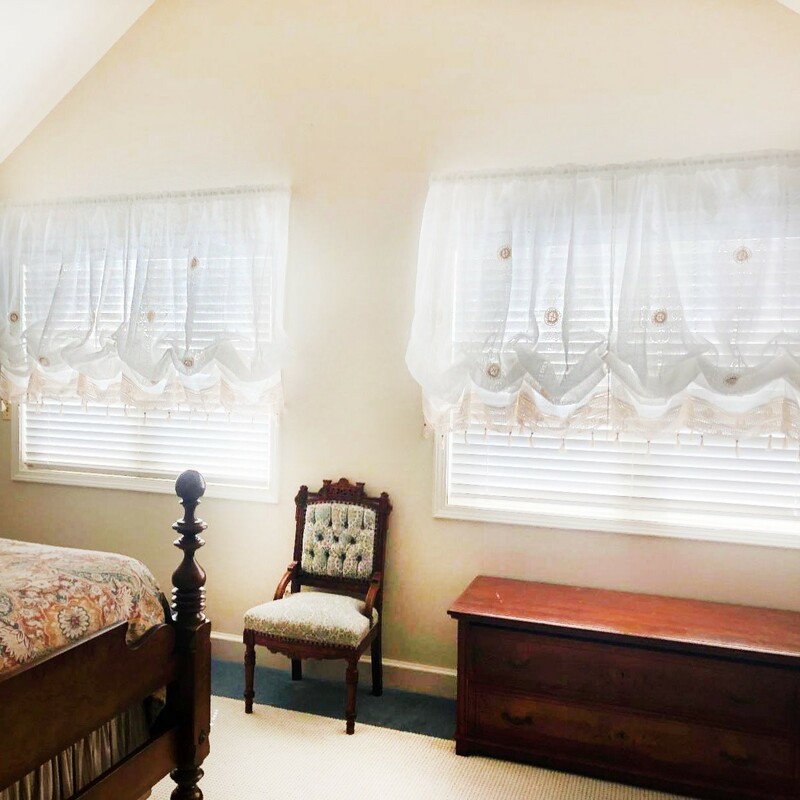 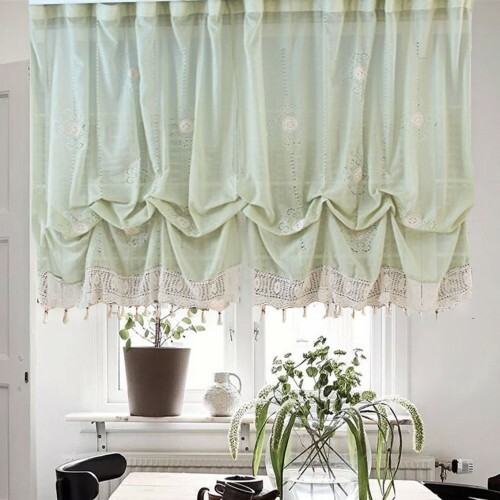 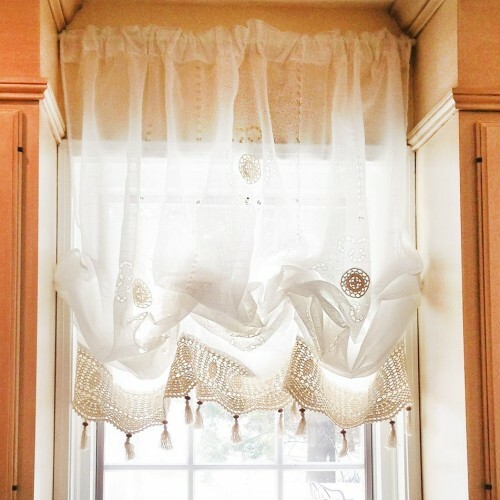 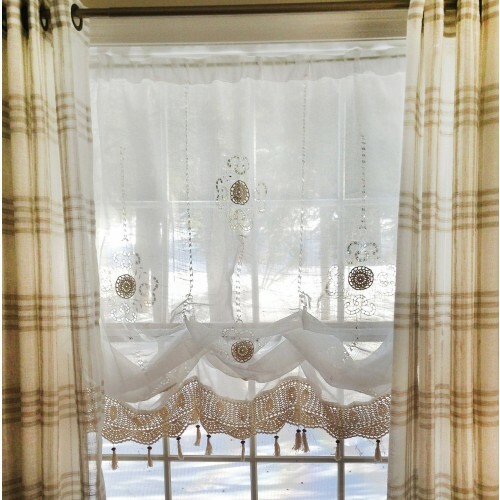 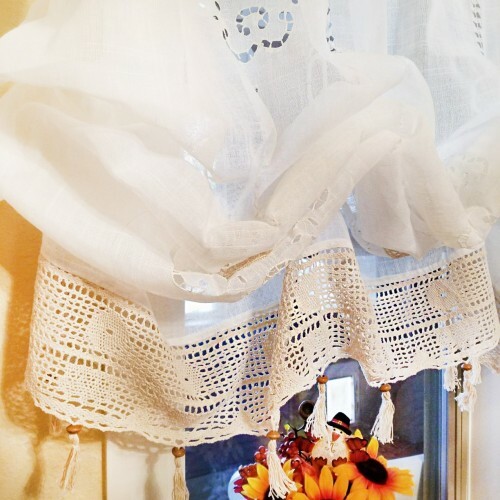 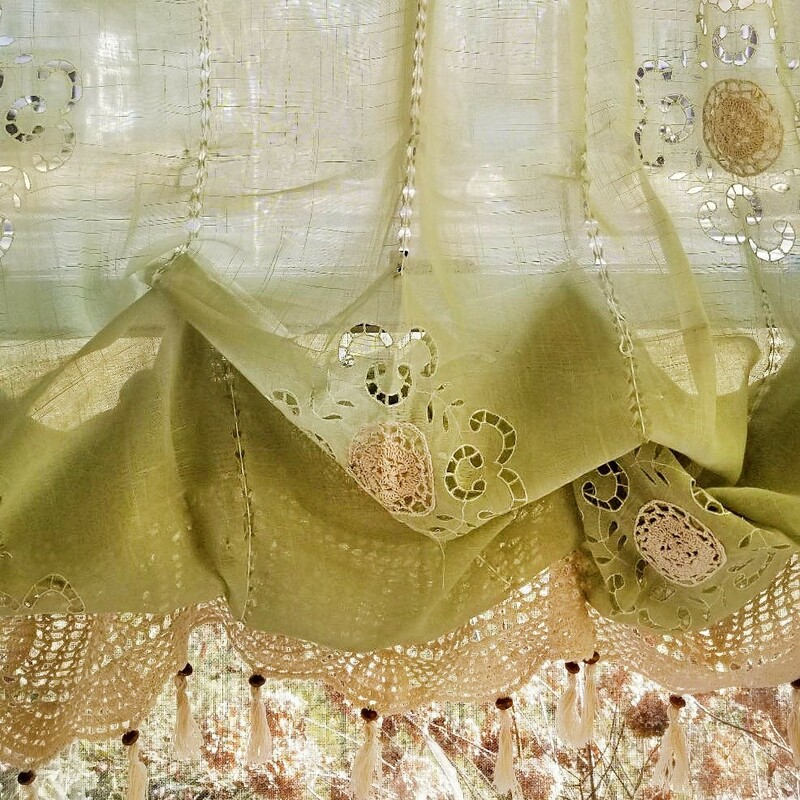 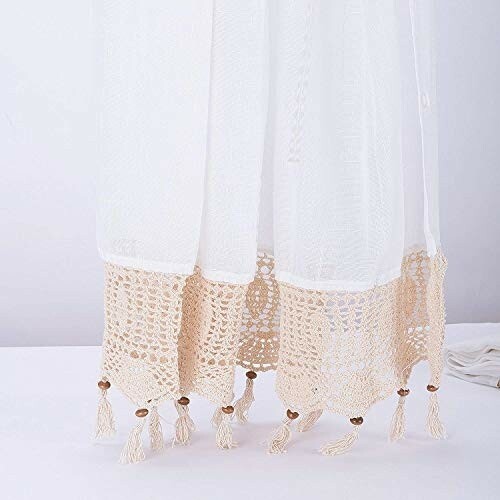 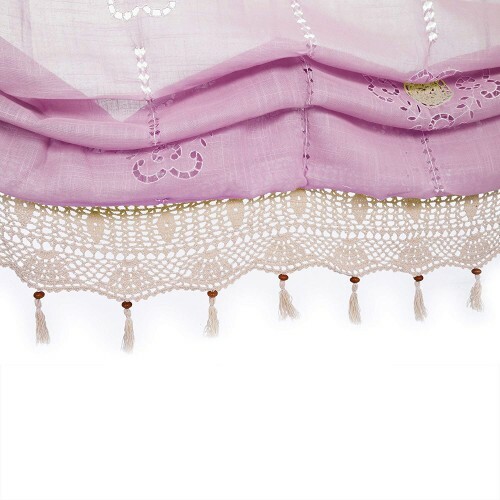 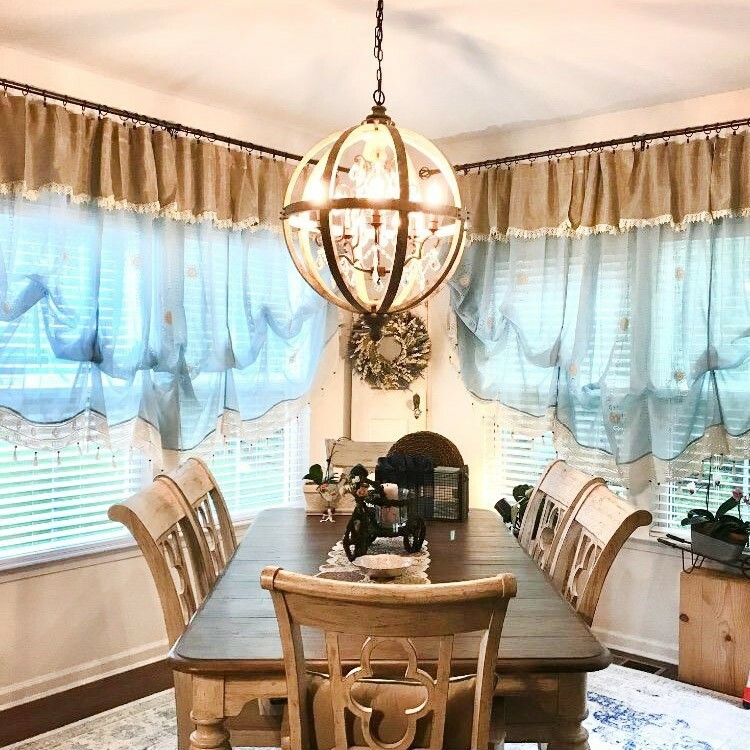 Shabby chic balloon curtain with crochet pattern makes it almost suit for every decor style such as vintage, classic, contemporary, country rustic, British cottage, Victoria, French Provincial, etc. 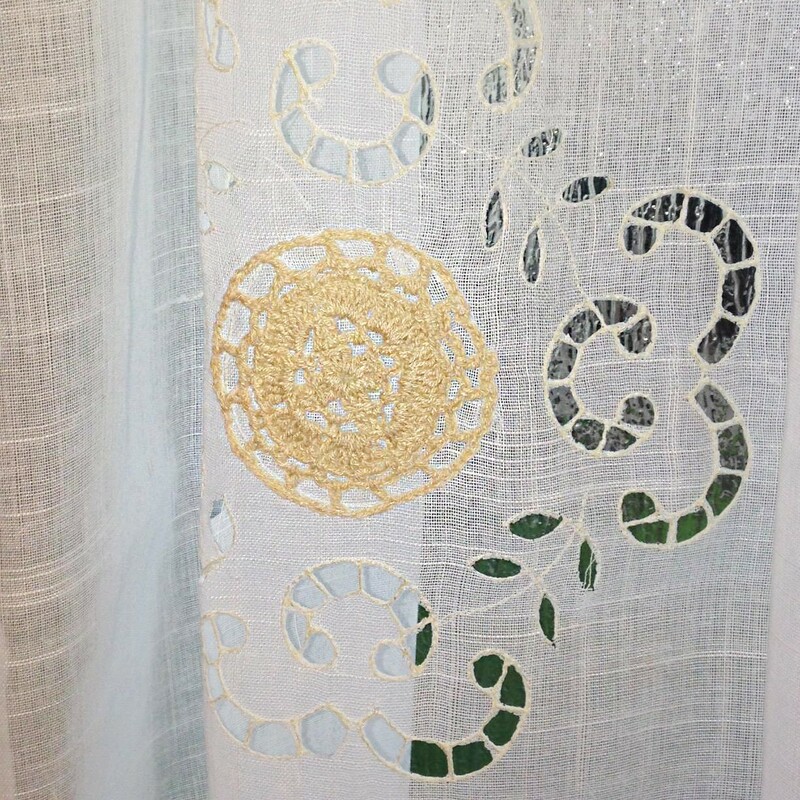 There are 4 columns of small rings stitched on the back of each panel. To get the look in the first picture, please use "C" shaped open rings to connect the small rings in the same vertical column. 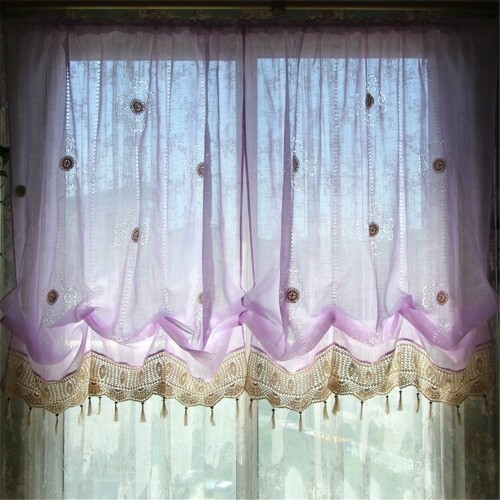 When the curtain is pulled up, it forms the balloons. The detail on the embroidery and tassels are beautiful! 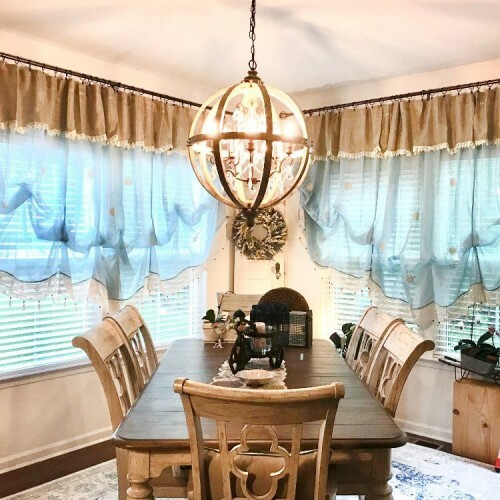 There are several ways to adjust and fix them, depending on how much ballooning you want, or if you want a curved edge or more of a straight edge. Some customers said the small rings are stitched loose and may need small effort to fix them. 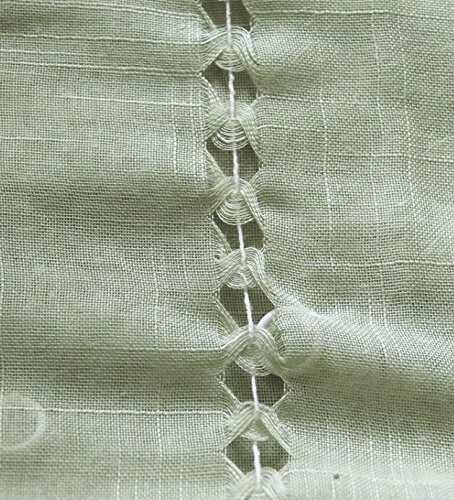 You can sew the small rings back when it happens. 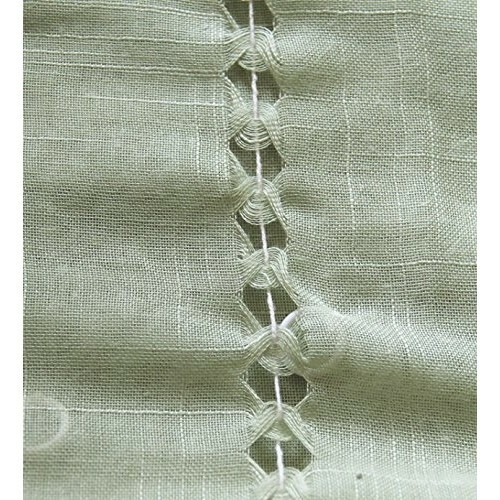 It is not a defect. 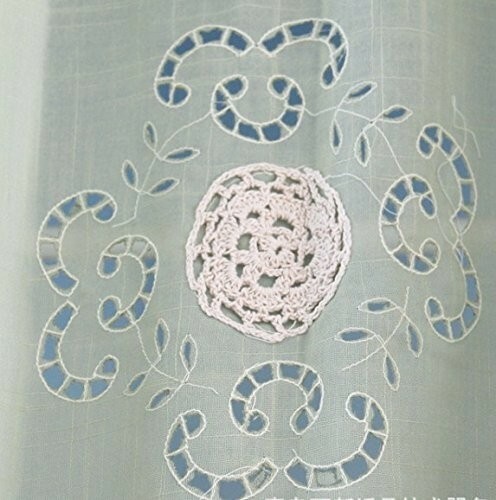 Material: cotton polyester mix. The fabric is stiff and not flimsy so it has the feel of higher quality linen without the expensive price. 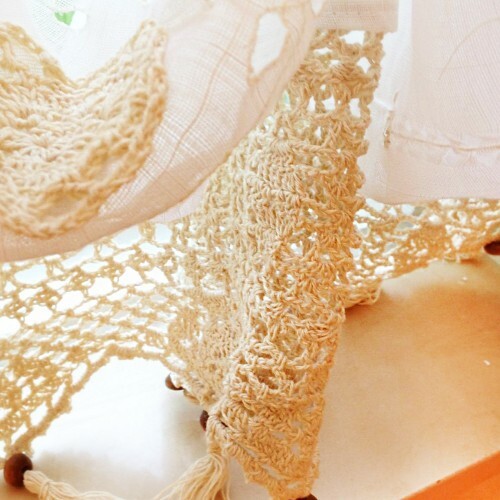 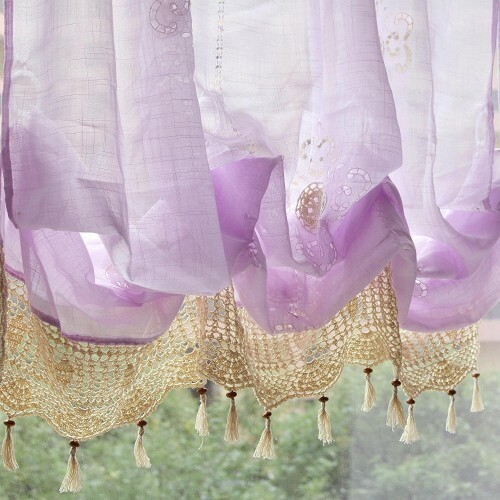 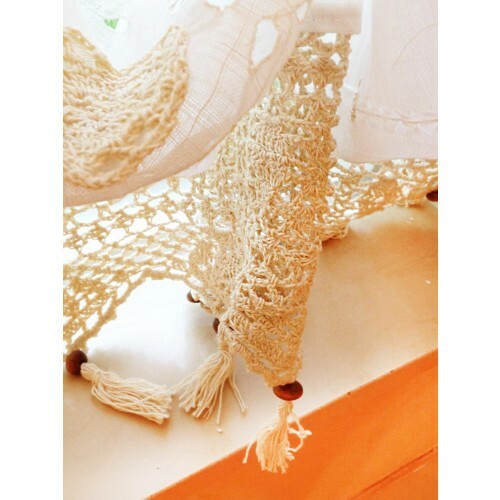 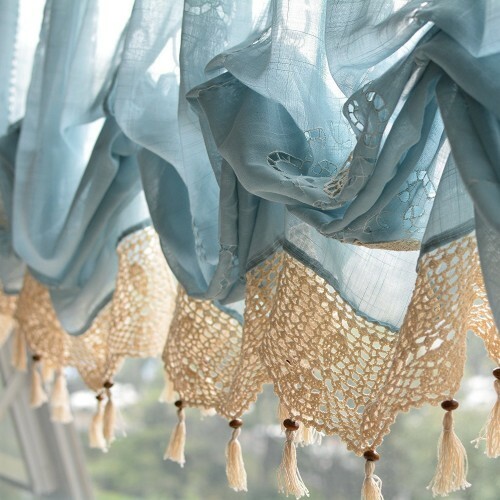 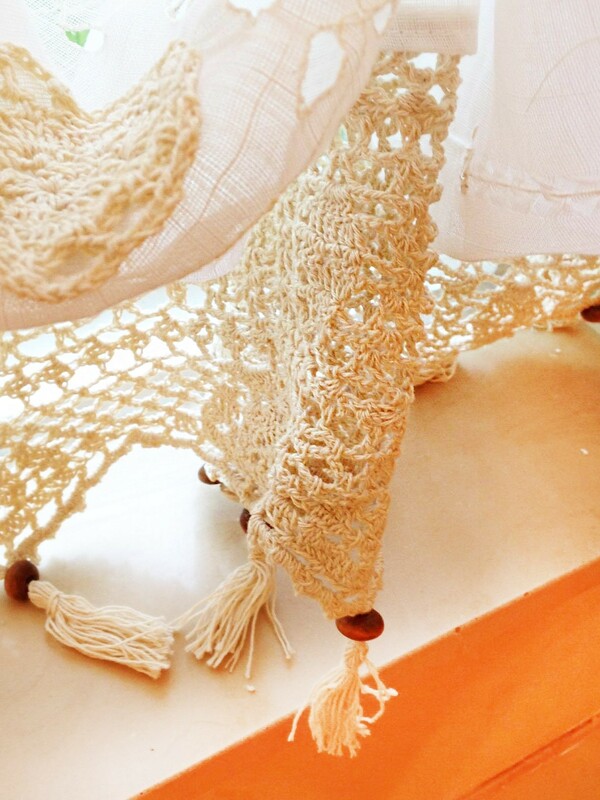 They’re soft and pretty, easy to hang and give a little privacy while letting the light in. Size:57" W x 69"L (145 cm x 175 cm) before gathered. 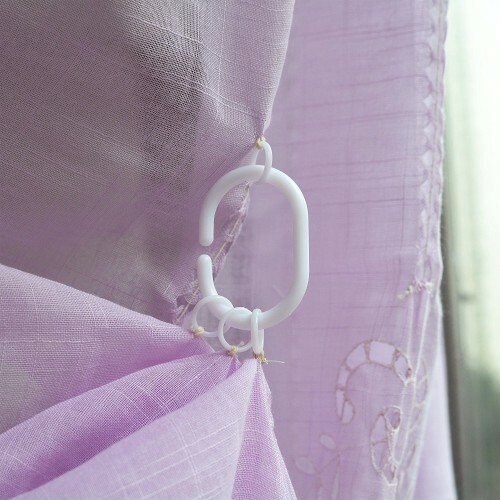 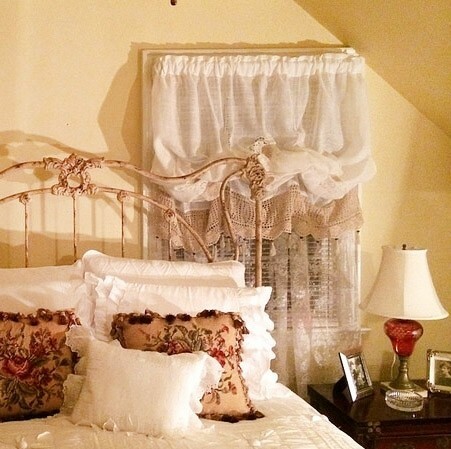 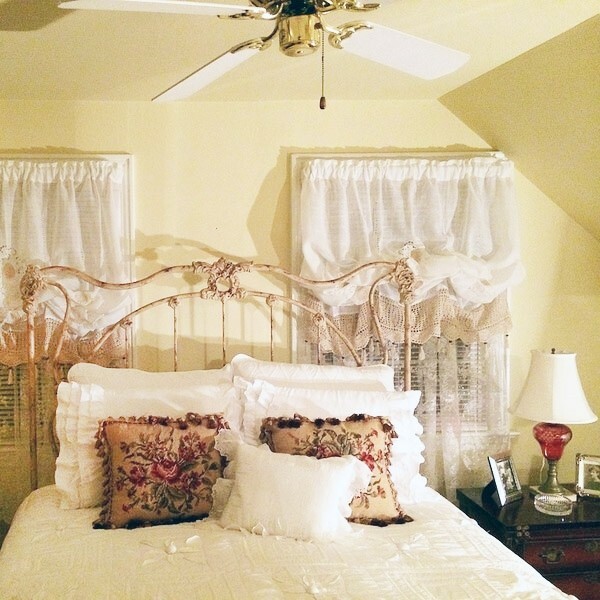 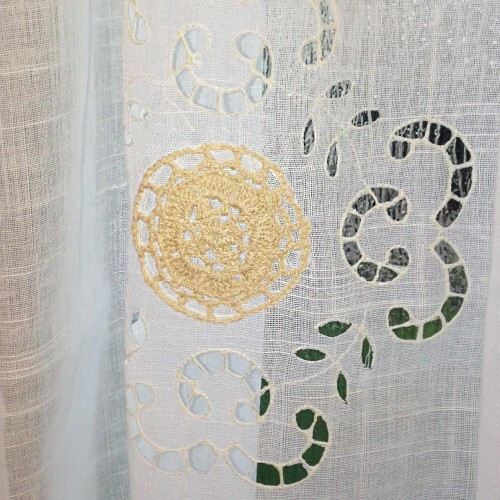 After the small rings are hooked up by the C shaped rings, the curtain becomes approx 40"L.
Price is for one shade. Please purchase more shades if your window is wider. The balloon shade is for decorative purpose only and is not suitable for being raised and lowered on a daily basis. 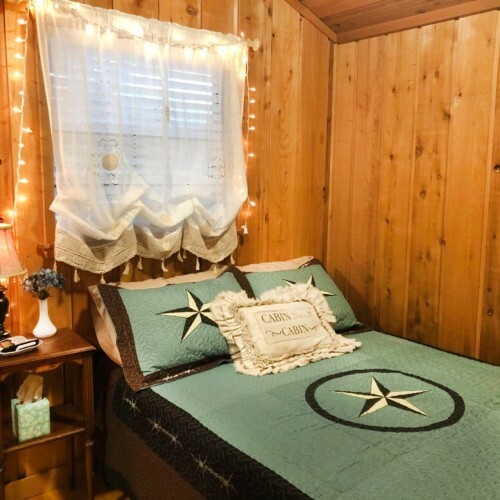 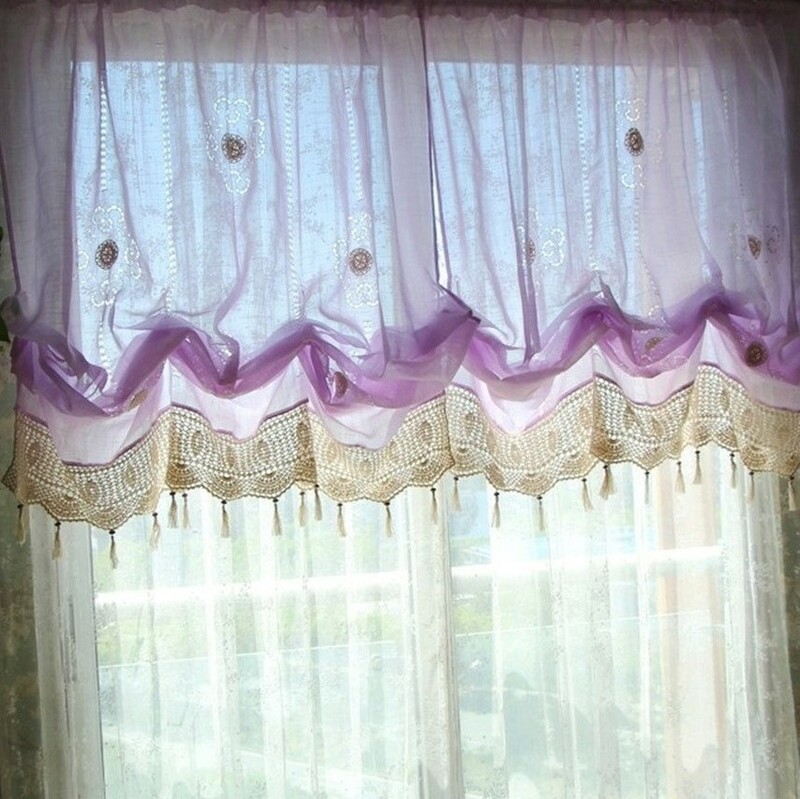 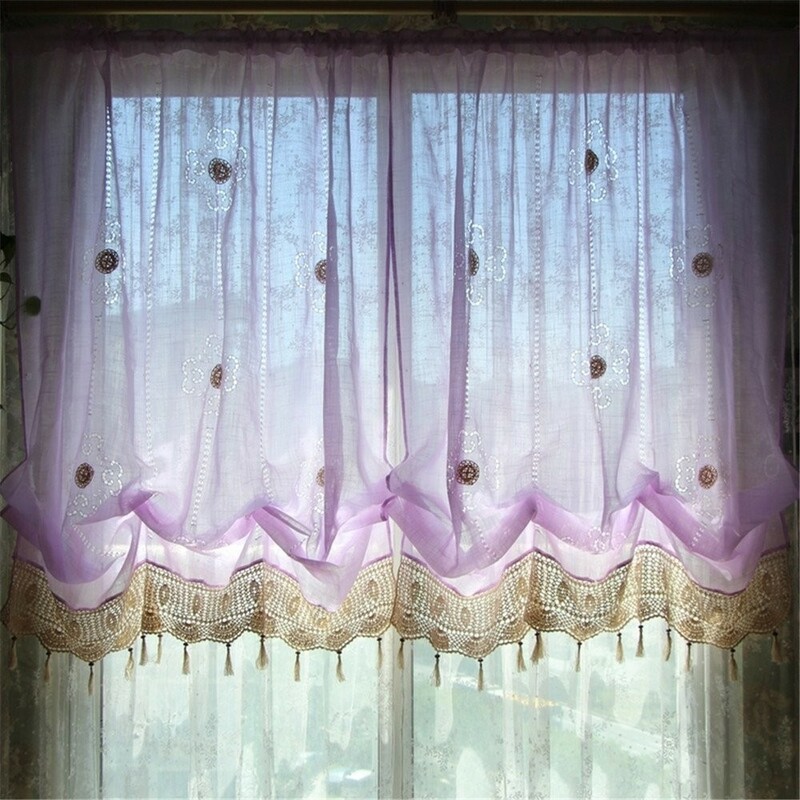 These are handmade curtains. 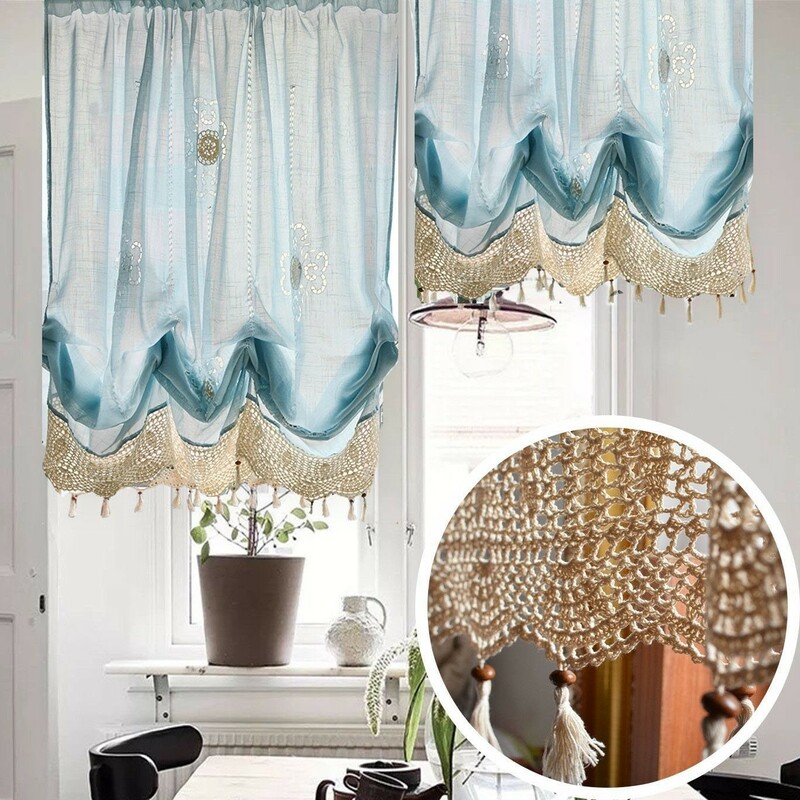 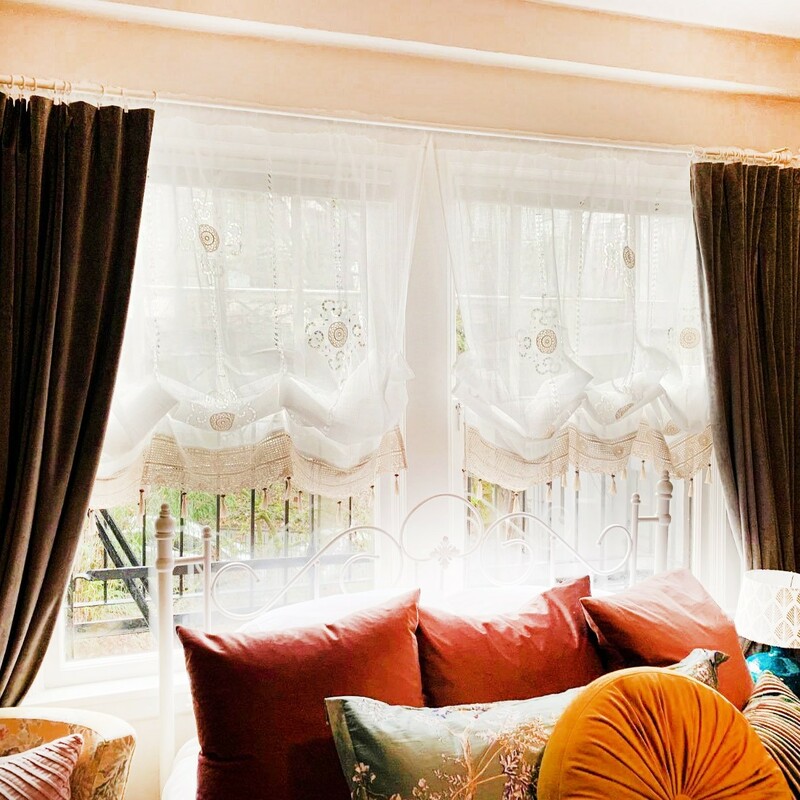 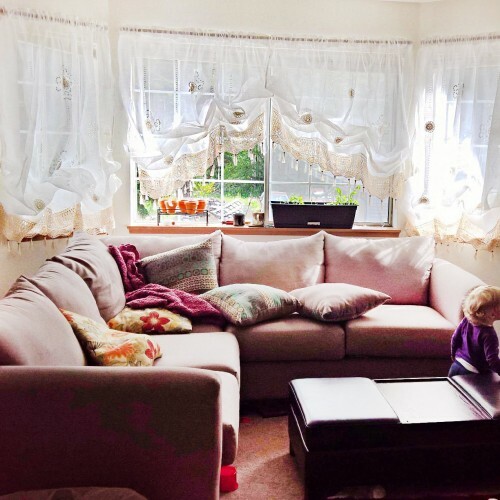 When you purchase one curtain on your 1st order and purchase another curtain on your 2nd order, the curtain length might not be exactly the same.